All Employers strive to create a safe workplace for workers and eliminate unsafe conditions. The root-cause of most workplace accidents is unsafe acts rather than unsafe conditions. Unfortunetly most investigations find the workers involved in the incidents had become complacent about safety. They’d gone on “autopilot” and stopped paying attention to what they were doing. Complacency on the job injures and kills. And it spreads like a disease from one worker to another. One employee sees a co-worker taking a shortcut and figures, “If he can do it, why can’t I?” You can’t afford to let complacency take over in your workplace. Regular short training courses and other workplace initiatives, ie. safety meetings, can assist to break this mindset. Through a strong commitment to regular safety training and awareness, you can create a safety culture that seeks out and eradicates complacency, replacing it with an emphasis on alertness, planning, hazard identification, problem solving, and accident prevention. 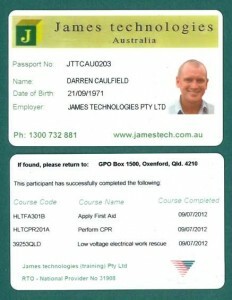 Below are some of the short courses Jamestech can deliver at your site, both within Australia and Abroad. In many countries, Government assistance could be available to businesses wishing to provide accredited training to their employees, enabling personnel achieve the skills, knowledge and attitudes required for superior workplace performance. 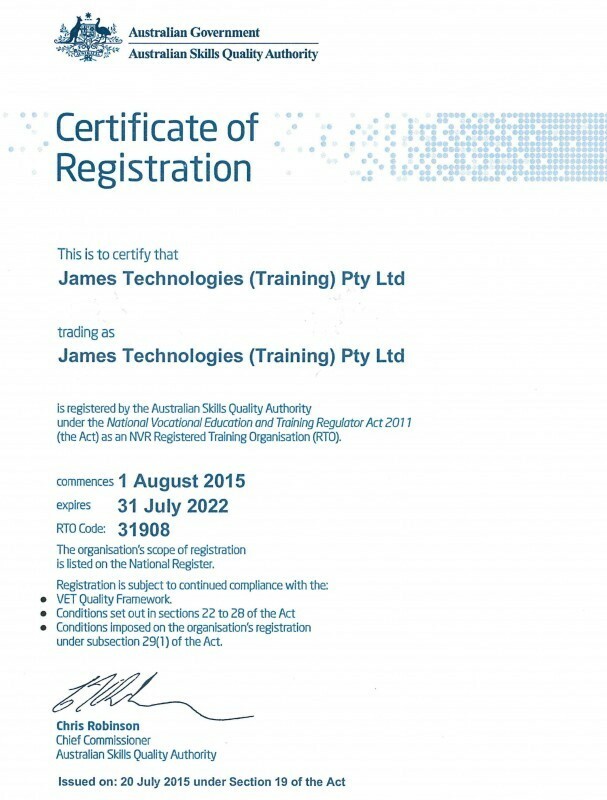 To continue Jamestech’s growth and commitment to providing a quality service and a focus on continuous improvement, The Jamestech Group became our own RTO (Registered Training Organisation) being James technologies (Training) Pty Ltd, RTO 31908. Jamestech are always willing to Partner with Companies, where our courses can be provided to you, for your trainers to deliver. This allows maximum flexibility and the ability for your trainers to contextualise the courses to suit your site. Your trainers deliver the courses and Jamestech reviews the assessments and provides competency certificates and / or hard passport cards to the attendees. On completion of this course, students will be able to assess hazardous electrical situations; take appropriate action to protect themselves and any victim of electrocution; rescue an electrocuted person without endangering themselves or others; and take appropriate action to prevent further danger to others. The skills and knowledge aquired in this unit relate specifically to performing Cardiopulmonary Resuscitation (CPR) and do NOT address other aspects of resuscitation, life support or first aid. Previously called, ‘Senior or Apply First Aid’, this course, is considered the preferred basic level first aid training level by almost all industry which requires staff to hold a first aid qualification. The training is able to be delivered in a 1 day face-to-face format, or in a ‘Flexible Learning’ format. Provide first aid (previously Senior or Apply First Aid), aims to cover all of the critical first aid information and skills necessary to ensure participants are able to confidently and safely initiate (1) a first aid response, (2) basic life support and (3) situation management (including of the incident and bystanders or other first aiders), until the arrival of medical/advanced assistance. This course is designed for personnel who are involved applying basic risk control processes, such as Job Hazard Analysis (JHA) or Job Safety Analysis (JSA), at a mine site or industrial facility. This course involves trainees identifying hazards, assessing risk, identifying unacceptable risk, implementing risk treatments, and completing recording records. Participants will acquire the skills and knowledge required for the provision of essential First Aid; and be competent in recognising and responding to an emergency using basic life support measures. The participant will be able to provide an initial response where First Aid is required: but is not expected to deal with complex casualties or incidents, and will be working according to established workplace First Aid procedures and policies. This unit is appropriate for those working in confined spaces (enclosed or partially enclosed) for the purpose of carrying out work or inspections and also is appropriate for those performing sentry or stand-by person roles. 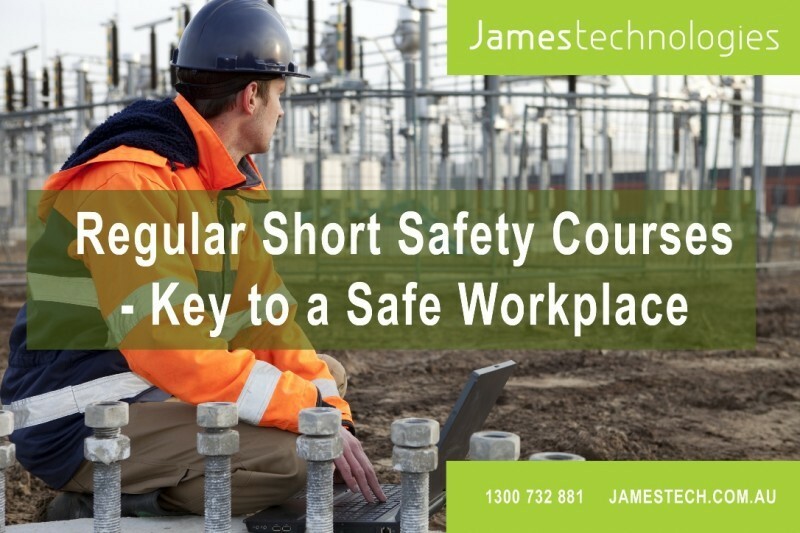 To book training for your staff by one of our Jamestech Trainers, please call 1300 732 881.